One of the greatest advantages of these marshes to the original settlers was the fact that they provided ready fodder for their cattle. The clearing of the land and the cultivation of upland hay was engaged in almost immediately, but the marsh hay meant that the cattle would not starve waiting for the harvest of the first crops. Although large natural marshes were available to these settlers in Yarmouth County, often they expanded these same marshes by the construction of dikes. Methods were developed for harvesting this hay and preserving it for the winter months. This involved storing the hay on the open marshes on structures which kept it elevated above the marsh and protected it from the water when the marshes flooded. These harvesting methods may have been ancient, and were probably practiced in Europe long before they were introduced to the New World. There were a number of reasons that local farmers continued to employ these ancient methods for such a long time. While it was possible for men to work on the marsh, the soft ground made it impossible for wagons and carts to be employed for much of the year, due to the fact that their wheels cut into the earth and became bogged down. With the hay stacked on the elevated platforms, the farmers could await cold weather when the marsh was frozen in order to bring the hay to their farms. Storing hay in this manner also meant that more space in their barns could be devoted to upland hay, which was more nutritious. The salt hay was often mixed with upland hay in order to make it last longer, often at the noon feeding of the cattle. It was also possible to feed cattle for periods of time exclusively on the salt hay. 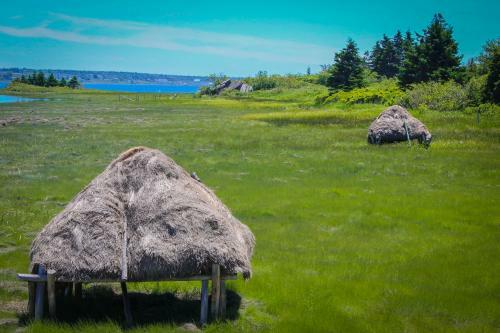 The Acadian term for haystack was ‘’une barge.’’ The wooden framework on which the hay was stored was called a ‘’staddle’’ by the English. The Acadians referred to this same structure as a ‘’chafaud’’ (échafaud’’ being the proper word) or carré. The Acadians referred to the staddle as a ‘’carré’’ probably to differentiate between this type of stack and those which were constructed in a round or circular manner. ‘’Carré’’ simply means square. The completed haystacks had a distinctive shape and were designed to allow rain water to run off the haystack. These haystacks were left in the open weather on the marshes. The harvesting had to take place between flood tides and the staddle would keep the hay up off the marsh and out of the water during high courses of the tide. On the salt marshes in locations like Pubnico the hay harvester also had to work with the tides. The hay had to be cut and the haystacks made between flood tides. The best time for cutting hay was early in the morning. The dew lubricated the hay and made it easier to cut with the scythe. The hay on the marshes was always cut by hand with scythes. A man who was good with the scythe could cut about four tons of hay in a day. This would have been enough hay to construct about four haystacks. After the hay was cut down, it would be teddered with a pitchfork, and then left for a day or two to dry before it would be raked. The hay was then raked into long rows called windrows by the English or ‘’les grands rouleaux’’ by the Acadian farmers. This raking was done in a very methodical way, with people usually working in three`s. These windrows were then rolled into a larger bundle of hay referred to as a haycock by the English, or a” mulronds” by the Acadians. It took 30-40 of these haycocks or mulronds to make a haystack. Some farmers were meticulous in their efforts to make sure that each haycock was exactly the same size and contained the same amount of hay. Ideally the haycocks were formed the day before one was going to make the haystack itself, because that allowed the hay to settle a bit and make it easier to carry and handle. The building of a stack took about one and a half hours. As the stack neared completion another job done by the person on the ground pitching up the hay was the constant raking or combing or dressing of the stack from the ground. This would remove any loose hay, which would then be raked up and pitched yet again onto the haystack. Although this was a slow and tedious process, it meant very little waste occurred. When the haystack was finally completed, two weights were placed over it. These consisted of two pieces of wood tied at each end of a piece of rope and hung down each side of the haystack.